Conservative Dinesh D’Souza sums up his new book The Big Lie thus: The Left is Fascist, not the Right as the Left alleges. What is wrong with D’Souza’s picture? 1. It is true that there is no agreement among scholars about whether or not there is such a thing as “generic fascism,” but historians have created a mountain of scholarship attacking the general notion of “fascism” as a generalized type. I have myself made the distinction between specific forms of “fascism” here, trying perhaps to get out of the muddle by making autodidacts empowered by the printing press the underlying target of authoritarian wrath. 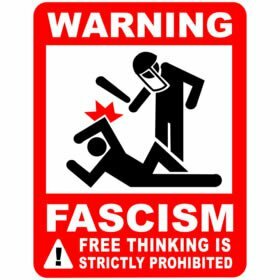 (See https://clarespark.com/2013/04/21/fascism-what-it-is-what-it-is-not/.) My opinion: D’Souza is throwing around dated concepts he doesn’t understand; 1930s Pop Front/New Deal liberals accused their conservative opponents of “fascism,” while some liberals returned the favor by smearing the New Left with the same moniker (and with respect to the New Left mystification of class relations, the liberals were accurate). 4. I still do not know how to answer the question I posed at Pacifica radio (KPFK-FM) in Los Angeles in the late 1980s-90s: “How Do We Know When We Are Not Fascists?” The much vaunted notion of “free speech” is, in my view, a ploy by “antifascists” to legitimate the Democratic Party and the forces against “political correctness.” No one has solved the problem of authoritarianism, that can be either subtle or direct. I continue to puzzle over this baffling ambiguity. That is the tortuous path that I, as a freethinker, tread. D’Souza would have done well to read https://clarespark.com/2014/12/10/were-nazis-socialists/.